Wrapping up my first full semester as faculty here in Communication at MSU, I can finally reflect on the semester and what’s been happening. Looking at both the positive and negative effects of moral portrayals, including character ambiguity, moral license or cleansing, and consequences for altruistic and egoistic behavior. Of course this touches on my own work, but also new stuff coming out from Mina Tsay and Maya Krakowiak, Morgan Ellithorpe and David Ewoldsen, and Sven Joeckel and Layla Dogruel, among others. Focusing on the role of the audience in perception of morality, particularly in terms of attributions about character motivations and in terms of audience moral deliberation/entering the moral playground of narrative and video games. This has been driven by several folks, namely Matthew Grizzard and Tilo Hartmann in video games, and Clare Grall, Nick Bowman, and Ron Tamborini in narrative. Charting the developmental effects of sociomoral portrayals in media on children. This has been coming for a while (particularly from Robert Lewis and Lindsey Hahn) but I confess it hasn’t really interested me terribly… until I got involved in a project looking at moral intuition salience after points of moral conflict in Brave. Excited to work on those data with Serena Daalmans and Lindsey Hahn this coming year. Identifying the neural correlates/ROI for moral reasoning in narrative. I can’t say much but be ready for some really cool papers coming out in the next year on this topic! Of course the big news in media and well-being research was the publication of the Routledge Handbook of Media and Well-Being, edited by Leonard Reinecke and Mary Beth Oliver. Such an incredible volume that pulls together established and new scholars to tackle this important topic. Leonard and I are also currently working on the special issue of Journal of Media Psychology on Media and Well-Being, which will come out in 2017. Teaching this semester was incredible. I had a lovely graduate seminar on historical perspectives and current developments in mass communication theory. We covered a range of topics and perspectives, and I had the pleasure of reading excellent final papers extending or refining existing mass comm theories/perspectives such as Uses and Gratifications, Reinforcing Spirals, Two-step flow, and Social Cognitive Theory. It was a class I’d taken once from John Sherry and once from Steve Lacy, so it was especially exciting to teach from both those perspectives in my first term back at MSU. In short, although I miss the VU and living in the Netherlands quite a bit some days, I am on the whole still overwhelmingly pleased to be back in East Lansing and with the incredible faculty, students, and opportunities available at Communication Arts & Sciences here at MSU. Onward and upward to 2017! Nice blog post (in Dutch) about our work on how consumers select apps from the app store from my colleague Christian Burgers at the Vrije Universiteit. He touches on two recent articles looking at 1) the use of heuristics and 2) visual metaphor in app download decisions. We have a new paper underway that further examines the use of visual metaphor in app downloads, extending our findings from the transportation domain to the medical and finance domains. 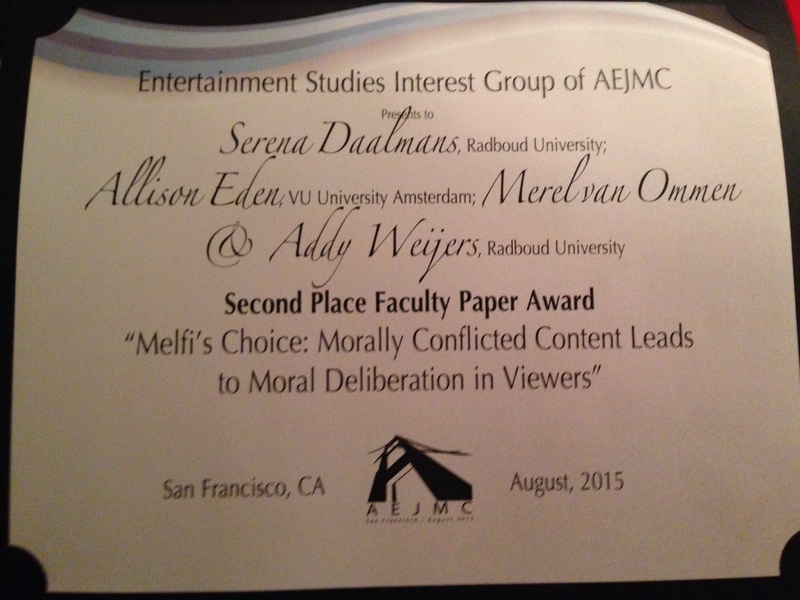 Our paper “Melfi’s choice” – which analyzes viewer reactions to the moral conundrum faced by psychologist Jennifer Melfi after being sexually assaulted in the television drama “Sopranos” – received a top paper award at the recent AEJMC conference in San Francisco. Congrats to all coauthors for a wonderful job!